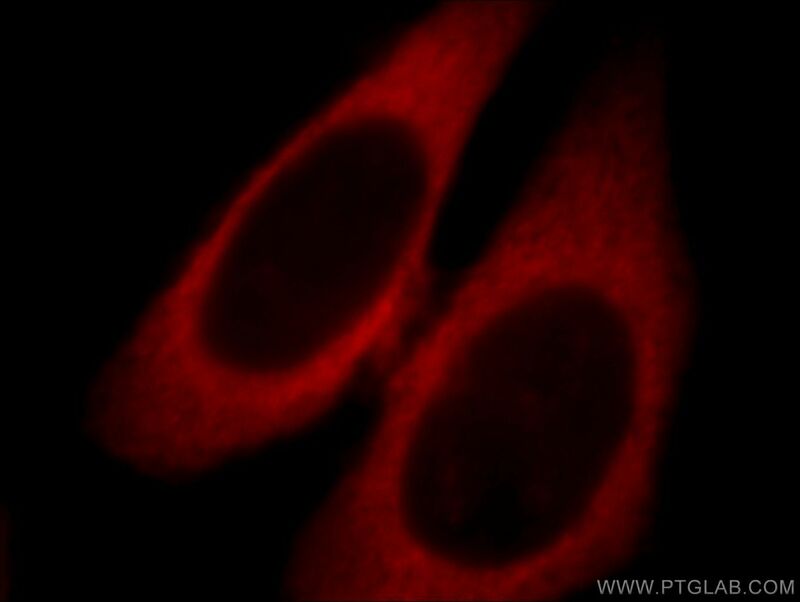 Immunofluorescent analysis of Hela cells, using SMCR7L antibody 20164-1-AP at 1:25 dilution and Rhodamine-labeled goat anti-rabbit IgG (red). 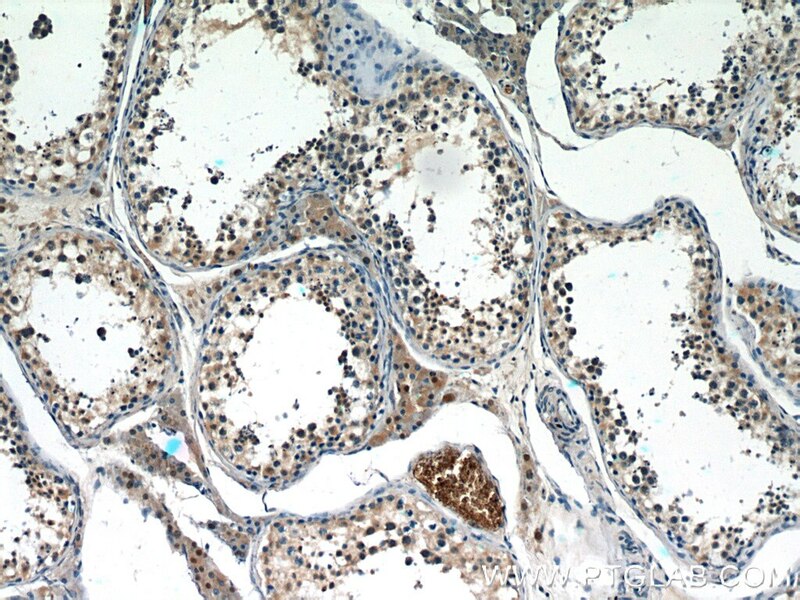 IP Result of anti-SMCR7L/MID51 (IP:20164-1-AP, 3ug; Detection:20164-1-AP 1:1000) with RAW 264.7 cells lysate 2400ug. Human SMCR7L gene encodes, MID51, the mitochondrial dynamic protein of 51 kDa (also called mitochondrial elongation factor 1, MIEF1). MID51 is a single-pass membrane protein anchored to the mitochondrial outer membrane and regulates mitochondrial morphology. Mitochondrial morphology is controlled by two opposing processes: fusion and fission. Elevated MID51 levels induce extensive mitochondrial fusion, whereas depletion of MID51 causes mitochondrial fragmentation. MID51 interacts with and recruits Drp1 to mitochondria, suggesting a critical role of MID51 in regulation of mitochondrial fusion-fission machinery in vertebrates. Drp1-dependent mitochondrial fission via MiD49/51 is essential for apoptotic cristae remodeling. Cooperative and independent roles of Drp1 adaptors Mff and MiD49/51 in mitochondrial fission. Low-level laser therapy for beta amyloid toxicity in rat hippocampus. 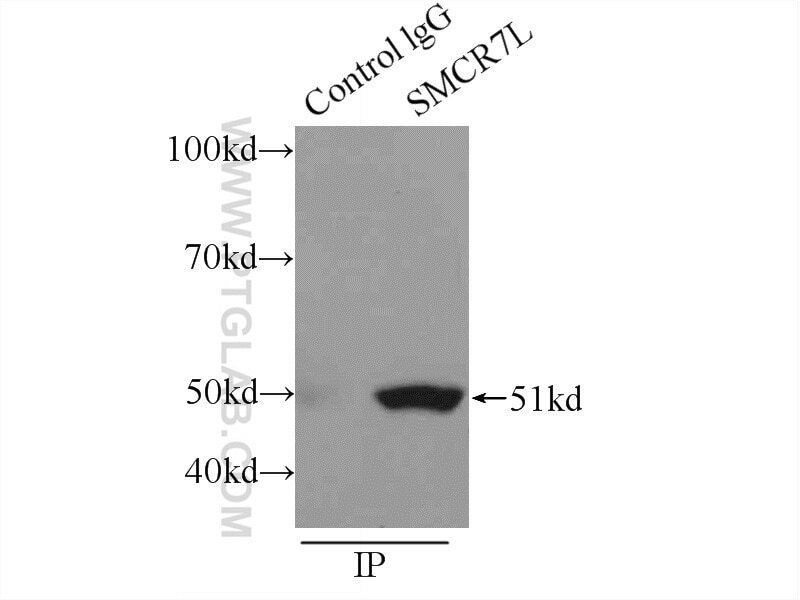 Rapid degradation of mutant SLC25A46 by the ubiquitin-proteasome system results in MFN1/2 mediated hyperfusion of mitochondria. Fatty acid synthesis is critical for stem cell pluripotency via promoting mitochondrial fission.